At 8:12 AM on October 15, 2013, a 7.2-magnitude earthquake struck Bohol and nearby provinces as recorded by the PHIVOLCS seismic monitoring network. The epicenter was plotted at 9.86 degrees N and 124.07 degrees E at a focal depth of 12 kilometers. In areas where the earthquake hit hard, destructive ground shaking were observed at Intensity VII to VIII on the PHIVOLCS Earthquake Intensity Scale (PEIS). The earthquake was generated by a reverse fault which had no previous surface manifestation. The resulting ground rupture created a wall of rock above the epicenter ranging from 0.10 to as much as 5 meters in vertical displacements. Other features such as scallops, bulges and warps, were also observed in the deformation zone, which extended as wide as 30 meters in some places. The earthquake sent terrified residents into deadly stampedes as it caused widespread damage to buildings and infrastructures – notably roads, bridges, houses and even icons of Boholano culture and heritage including churches dating from the Spanish colonial period. In the aftermath, some 211 persons recorded dead, with 877 injured and 8 missing. Damage to properties and business operations exceeds billions of pesos. Thankfully, the earthquake occurred on a holiday for the Muslim festival of Eid ul-Adha. Had it occurred on a working day or on a Sunday, more people would have been killed or injured while they would have been on their respective workplaces, classrooms or attending mass in churches. In just minutes after the earthquake, the Provincial Disaster Risk Reduction and Management Council (PDRRMC) immediately convened to establish the PDRRMC Command Center. The PDRRMC immediately responded to concerns of Communications, Search and Rescue, and Emergency Response. 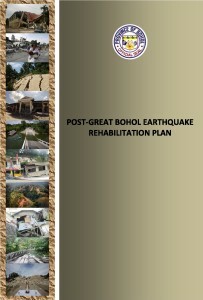 After all threats to life and property have been addressed, a Damage Assessment and Needs Analysis (DANA) was carried out by the Provincial Government of Bohol (PGBh) in coordination with the Municipal Local Government Units (MLGUs) as a basis for an informed approach to the drafting of the plan for restoration. From the DANA, the early recovery plan was conceived and this rehabilitation plan was formulated. Download the document from the link below. Hi. I’m a researcher conducting a post damage assessment related to the 2013 Bohol earthquake. I’m looking for building inventory data (before and after the earthquake), damage survey reports and estimates of structural repair/reconstruction. These would be helpful in assessing the vulnerability of structures in Bohol. Could I request these data from your office? Thanks. I’m afraid we don’t have the data you need. The damage reports were not finished because we have to formulate the rehabilitation plan, which is the basis for funding assistance. It is assumed that the structures requiring rehabilitation were damaged, though these may not include privately owned structures. If it helps your research, you may download the damage reports that we have in digital format. Just click on the link below to start downloading. Many thanks for your very prompt response. I downloaded the damage reports from your link, thanks a lot. I’m a researcher from Australian National University. 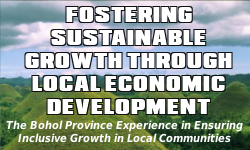 We recently conducted a short field visit in Bohol and we were able to introduce our research to Gov. Chatto. Would it be fine to discuss the more pertinent details of our research with you in an email? We have already contacted Atty. John Vistal regarding this, and we’re awaiting for his feedbacks. Hi. I am a researcher and conducting a thesis for the Provincial Capitol of Bohol. I’m also looking for its building inventory data (before and after the earthquake), and its damage report. These would be very helpful in my research. Could I also request data from your office? Thank you very much! I have some photos of your temporary location of your capitol, and I just wanted to have the said data to be included in my research for the proposal of disaster resilient provincial capitol. We’re not sure what data (“building inventory data”) you require. Perhaps the Earthquake Rehabilitation Plan might provide some help, assuming what is to be rehabilitated were the ones damaged. We hope you find this useful. Thank you for giving the link, and I have already downloaded it. 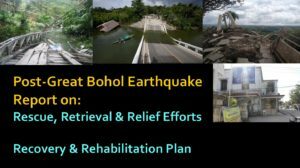 I think I will visit Bohol to personally visit Bohol Provincial Capitol to gather additional data and look at its condition. Hi. We are an architecture student who is conducting a thesis and we have chosen Bohol as our site. Due to the earthquake that hit, considering the earthquake resiliency of a building is a must. That is why we are hoping if we could ask some data or any actions done related to strengthening/retrofitting buildings or maybe some laws implemented on the minimum strength or structural designs required specially after the earthquake hit. Thank you very much! We would like to refer you to the Provincial Engineer’s Office. Engr. Eustaquio Caliao is the one in-charged with your subject matter. Thank you sir for that information, but do they have a website or email address that we can contact?